At the start of the postgenomics era, most Parkinson’s disease (PD) etiology cannot be explained by our knowledge of genetic or environmental factors alone. For more than a decade, we have explored gene–environment (GxE) interactions possibly responsible for the heterogeneity of genetic as well as environmental results across populations. 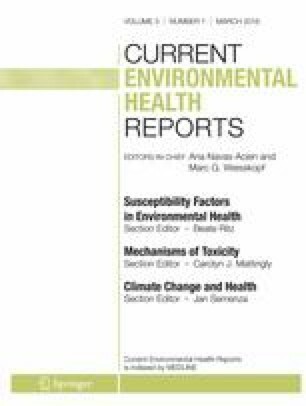 We developed three pesticide exposure measures (ambient due to agricultural applications, home and garden use, and occupational use) in a large population-based case–control study of incident PD in central California. Specifically, we assessed interactions with genes responsible for pesticide metabolism (PON1); transport across the blood–brain barrier (ABCB1); pesticides interfering with or depending on dopamine transporter activity (DAT/SLC6A3) and dopamine metabolism (ALDH2); impacting mitochondrial function via oxidative/nitrosative stress (NOS1) or proteasome inhibition (SKP1); and contributing to immune dysregulation (HLA-DR). These studies established some specificity for pesticides’ neurodegenerative actions, contributed biologic plausibility to epidemiologic findings, and identified genetically susceptible populations. The online version of this article (doi: 10.1007/s40572-016-0083-2) contains supplementary material, which is available to authorized users. This work was funded in part by NIEHS Grants R01-ES010544, U54-ES012078, P01ES016732; the Michael J. Fox Foundation; The Parkinson Alliance, and the American Parkinson Disease Association. The funding organizations had no role in the design, conduct, interpretation, or publication of this work. Kim Paul also reports support from the Burroughs Wellcome Fund. BR Ritz, KC Paul, and JM Bronstein declare that they have no conflict of interest. Written informed consent was obtained from all enrolled subjects. All procedures using animals were approved by the UCLA Human Subjects Committee.